The DH2014 poster is now out! Dario Rodighiero—Designer and Doctoral Assistant at DHLAB, EPFL—has created the DH2014 conference identity. The identity is built upon a network, and this network is composed entirely of keywords describing DH2014’s accepted papers and posters. Two keywords are connected if they are used in the same paper, and an edge’s weight is given by the number of papers using these two keywords. Furthermore, to increase the depth of layers, edge thickness has been intensified according to the number of authors creating these pairs, emphasizing their voices. However, to see the big version, you’ll have to come and visit us at DH2014 in a couple of weeks…. In order to provide the organizers with participant lists, in particular for those workshops requiring preparation and pre-work, we will be closing online workshop registrations on Wednesday, June 25th. Workshops can be selected as part of the initial conference registration process or added/changed by logging-in to the registration site again using your username and password. Please click through to the end of the registration process (acknowledgement step) to ensure that any changes you make are saved. On the acknowledgment page, there will be a link to your personal calendar, so you can double-check that your registrations/modifications have saved. Conference registration will, of course, still be available online until July 5th and then on-site afterwards. Please note that if arriving on to register on-site on either of the workshop days (July 7th and 8th), you will be limited to workshops that still have space available & did not require pre-work/preparation in advance. Please note that hotel reservation via the online conference registration page has now closed. Should you require accommodation, you will now have to book directly with the hotels. Just a quick reminder to all conference participants, and potential participants, that the deadline for reserving your accommodations via the DH2014 registration site is coming up shortly: May 25, 2014. Our partners at Lausanne Tourism currently have group bookings for DH2014 at a number of hotels in the Lausanne area; however, they are obligated to release any un-allocated rooms six weeks before the event (not that the hotels risk being left with unsold rooms during a peak period). Should you register for the conference after May 25th, you will need to take care of any accommodation needs by booking directly with the hotels. Please note that for those of you that have already registered for the conference but have not selected any workshops, you will need to login to the registration site using your username and password. The workshops are then located on the third step of the form. Please be sure to complete the registration process until you arrive at the end of the form (step “acknowledgement”), pressing the “submit” button on each page to ensure that the system validates your choices. Just a quick update regarding the status of the DH2014 bursary applications. We have just been informed that all of the winners will be notified next week. Thank you for your patience and best of luck. After some very hard work by Melissa on the scheduling, we now have provisional draft schedules for the workshops, panels, paper sessions and poster sessions ready to go. These schedules include all presentation titles and authors, as well as provisional timing. For those of you facilitating the sessions, we encourage you to take a close look for your presentations and let Melissa know if there are any conflicts that may have been missed or any additional concerns. 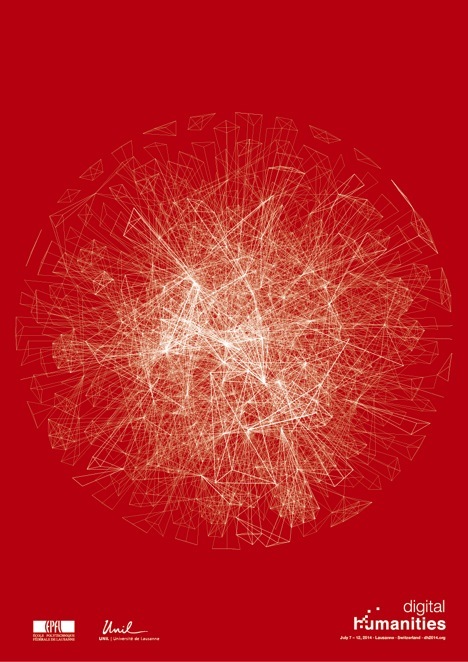 Download the #DH2014 networks here! The content of this site is licensed under a Creative Commons Attribution 3.0 Unported License, unless otherwise indicated.